BAR HARBOR — For some, the word “organoid” — a small collection of cells that behave like organs — might connote some far out idea, and until recently that would have been true. But scientists are now using this new tool to learn more about human development, disease and regenerative medicine. Organoids are miniature 3-D cellular structures that model the form and function of organs but on a small scale. Scientists at both The Jackson Laboratory and Mount Desert Island Biological Laboratory are involved in organoid development. In January of this year, the editors of the journal “Nature Methods” named organoids the 2017 Method of the Year. And the recipes differ from organ to organ, said Jackson Lab professor Martin Pera. He is developing an embryonic model of the human brain using human embryonic pluripotent stem cells—these are primitive cells that correspond to cells in the early embryo and can differentiate into any tissue in the body. Couples using fertility clinics for in vitro fertilization where the egg and sperm are initially joined in a dish often donate any leftover embryos to science. And it is a critical donation, said Pera, who has used these stem cells to develop a 3-D embryonic model of the human brain. Using recipes that mimic signals between cells in the early embryo, Pera’s team saw that when clusters of these primitive cells are put together in a dish they inherently know what to do in order to become a heart, brain or other organ. Once the process starts, proteins in the embryonic stem cells send signals from one cell to another. These “conversations” among cells in the brain organoid activate certain genes so that the organoid begins to take shape in a manner similar to the developing brain in a human embryo. For Pera and other researchers in his lab, these conversations allow them to see how genes affect normal brain development. Over weeks and months, they can observe how the cells grow as they interact with nutrients and how other types of cells support brain development. If one of the genes carries a mutation, said Pera, it can disrupt brain development and cause disorders such as Down syndrome or microencephaly. One of the current challenges with organoids is that they lack circulatory and immune systems and hence do not grow to approximate adult organs. They more closely resemble fetal tissue—a characteristic that makes organoids valuable for investigating genetic problems during fetal development. When tumors or organoids are inserted into animal models such as mice, the mouse’s circulatory system allows the tumor or organoid to grow and develop. Although The Jackson Laboratory has mouse models that have been engineered to accept human tissue, Pera at this point has not implanted brain organoids into a mouse. Rather he and his team are focusing on studying the development of the cortex and capturing some of the cell-to-cell conversations as these cells reprogram an amazing diversity of normal tissue. Developing organoids with human embryonic stem cells not only provides a new window on many aspects of human biology but also holds great promise for testing how individuals respond to drugs and may allow scientists to make specific tissue, or an organoid, that can be transplanted into a person. But, Pera cautioned, scientists are just beginning to explore the potential of this technology. 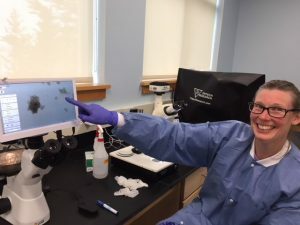 BAR HARBOR — Recently the Mount Desert Island Biological Laboratory (MDIBL) in partnership with Hubrecht Organoid Technology (HUB) offered a week-long course for 25 US and international scientists. HUB, which is located in the Netherlands, was founded to implement the pioneering work of Hans Clevers, a leader in the field of organoid technology. The course, which will be offered again next year, was one of the first to provide extensive hands-on training in organoid culture, said course organizer Hugo de Jonge, a professor at Erasmus University Medical Center (NL) and a long-time visiting investigator at MDIBL. MDIBL president and organoid researcher Hermann Haller called the course a model and the highlight of the year. “The people who developed organoids came here to teach this course—a course that provided hands-on experience with international faculty,” he said. During the course, participants not only used organoids developed from patients with cystic fibrosis and various forms of cancer but also organoids developed from mouse cells. Since the clusters of cells that eventually become organoids take weeks to develop, Lynne Beverly-Staggs, a research assistant at MDIBL who works in Haller’s lab here, began to assemble organoids with guidance from the people in the Netherlands who developed the protocols. She received frozen cultures in mid-April. After defrosting them, she began to grow these cultures, sometimes using single cells and sometimes clumps of cells. 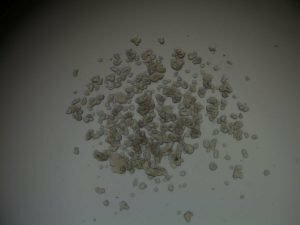 What determined the initial size of the cluster was the cell line. Once they reached a certain size, the clusters were split and then reformed. Every day, Beverly-Staggs sent picture of the clusters to the Netherlands, so that the experts there could tell her when to split clusters and whether the clusters were forming as they should. And early each morning—there is a six hour time difference — she got up and checked her email for further instructions. Once the organoid reached the desired size or shape — that depends on the organ they mimic—they were frozen in preparation for the course. It took her six weeks, but eventually Beverly-Staggs had grown enough organoid clusters so that each of the course participants could have their own individual organoids.